Already we are preparing and planning for our annual exhibition at the Hub in September. As with previous exhibitions, our increasingly popular visual displays about local historical events, places and people, will last a full month. The exhibition team is currently looking through the collection, which is stored at various venues around town, to selection fresh items for the upcoming event. As a holiday town with many visitors and interested locals, the activities, carnivals and festivals of the past always drew big crowds, as people on holiday often enjoy some form of organised entertainment. Local business also profit from the arrival of holiday makers and the special events staged. We are a beach, boating, sun and water holiday resort, and in years past Inverloch was noted for attractions that drew people in, where fun and fundraising for local charities, community organisations, and the Wonthaggi Hospital featured heavily. The New Year Carnival was always located next to the water and the jetty, where children were especially well looked after. As we became a more mobile society with cars and easy travel by train and bus during the 1930s, Inverloch attracted not only many Melbourne holiday makers but also, thanks to improved roads, many people from the Latrobe Valley who found that Inverloch was their closest beach resort. And so the Mr and Miss Inverloch competitions were born, along with the the sand castle competition for children. 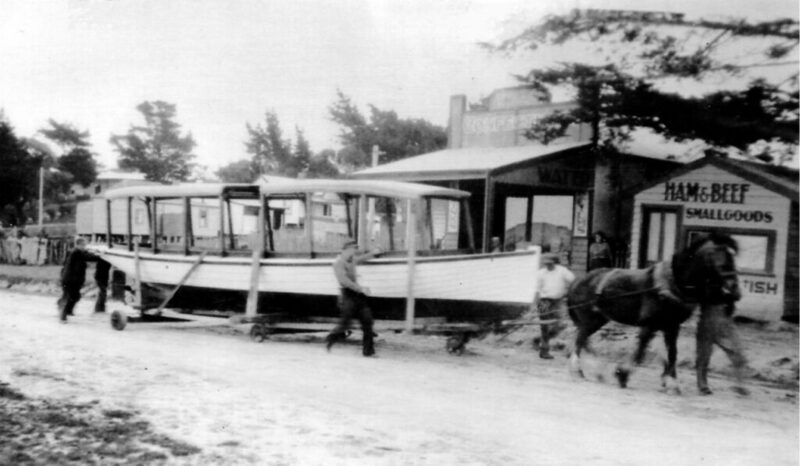 Interestingly, the New Year Carnival organisers and prize donors were usually Wonthaggi people, although Bill Ramsey, who was Chairman of the Foreshore Committee, played a big part in ensuring that Inverloch got its share of any funds raised so that Inverloch’s foreshore facilities were up to the mark. A popular prize with the ladies who entered the Miss Inverloch competition was silk stockings, a highly prized item back then when material shortages were common. Quite often the first prize was a ladies bike – plus, of course, the silk stockings! 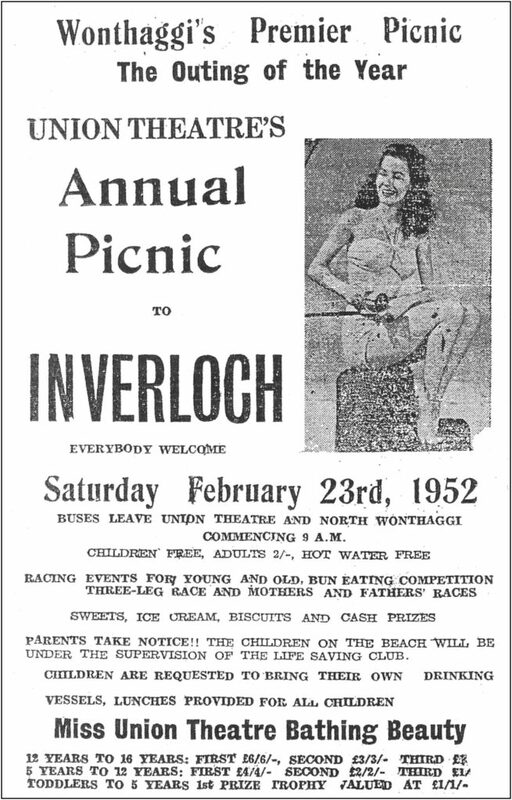 As you can see from the delightful old advertisement from the Wonthaggi Sentinel, back in February 1952, the Union Theatre, controlled by the Coal Miners Union at Wonthaggi, had their Annual Picnic at Inverloch. I invite you to read every word in the ‘ad’, for it delightfully demonstrates how much have changed. Children were well catered for, as were the adults, but there is an uncomplicated feel, innocence and pleasant look about the whole day, much of which we appear to have been lost from today’s world. It’s fascinating to come across ads like these, as they are highly collectable. Old newspapers are simply wonderful to read – not just the stories, but even the advertising. The Society has commissioned Inverloch Men’s Shed to make us a model of some rocket equipment – a vital piece of Victorian rescue equipment, of which Inverloch was a proud owner. Victoria has four Rocket Sheds – while Portland’s is built in bluestone, Inverloch’s is a more modest timber construction. But our’s should not dismissed lightly, for it is built in cedar timber, with the still original corrugated iron covering the roof and the sides of the building. The company stamp of the English manufacturer can still be clearly seen from within the interior of the shed. We look forward, following the 2019 Exhibition, to mounting a permanent display of the the rocket equipment, inside the Rocket Shed. Visitors and locals will finally be able to see and understand what the Rocket Shed and the rocket was all about! Our new installation will be on prominent display in September. The most recent donation to the Society’s collection is a Rangefinder. It is a piece of military equipment, for use mainly by the navy and army with some other non military uses. Contact with the RSL, both at Inverloch and Wonthaggi, has revealed that this one is from the late 1930, with a range of over 4,000 yards. This particular Rangefinder was built in Glasgow, Scotland and smacks of quality in every aspect. Housed in an impressive leather cylinder and large polished wooden box, complete with brass handles, the total package is extremely heavy. It works by using triangulation (how’s your old school maths!) to measure the distance of an object from where the viewer is situated. The operator can then instruct a gunnery officer to set the guns to the precise distance. Once set, the gunners would be instructed to fire! Not nice, not pretty, but darned accurate! Transporting Cal Wyeth’s (of Pine Lodge) Boat. Subscribe to receive the newsletter by email.